I made a number of these since I really liked them. I wanted to see if they were cuter if they were made smaller. I think they would be but I had problems working with the smaller paper and both of the smaller ones ended up with the same error. As I was writing this I made another attempt at the smaller one and figured out my error. 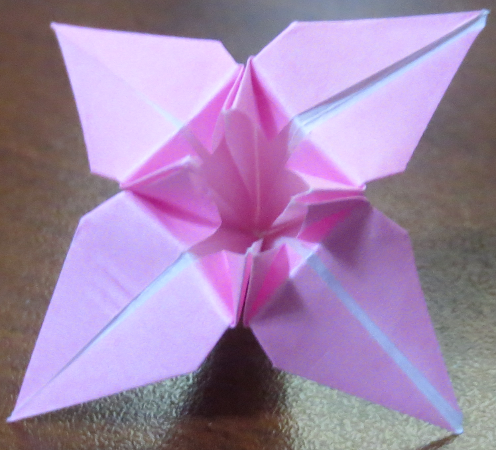 At 5:45 you fold a little triangle up. You repeat this step four times. If you miss one then one of the points in the end is missing and the model won’t sit right. 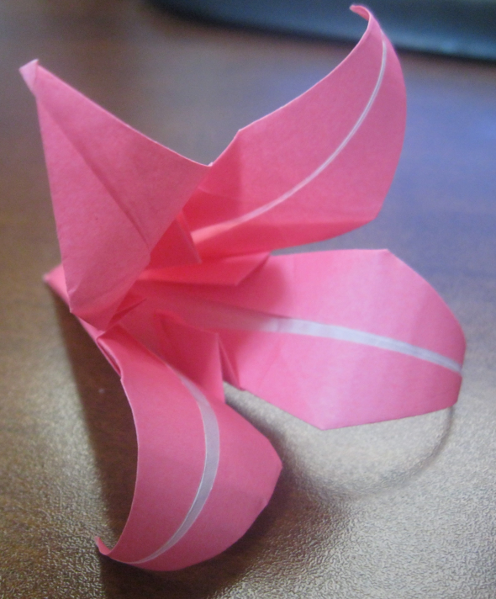 Happy: 8/10 It is another flower that I successfully made. Relaxed: 7/10 It was a little frustrating not being able to figure out my mistake. Intellectual: 9/10 It felt very good to finally figure out my mistake. 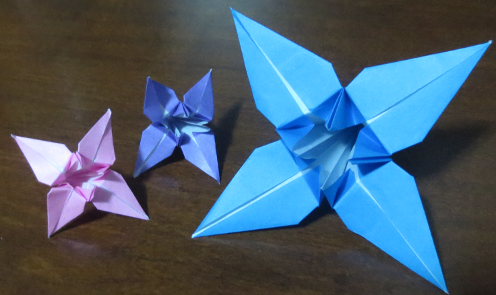 We got talking about origami when we had friends over and that meant the paper came out. 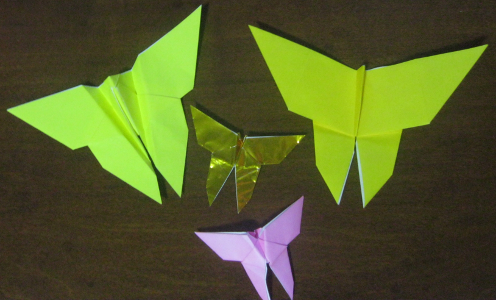 During that I was shown how to make a butterfly. Now I am writing about it and I am trying to find a video of it. Of course there are many many videos of butterflies. So I ended up making a couple but none were the same as the one we made that evening. The two smaller ones are the ones made that evening. The two big ones were made from two different videos. The one on the right is the one that I am going to talk about as it is the closest to the first one. I like the original ones better as they are a slightly tighter design but this is a close second. I would guess that the first ones we made are an improvement on the video one. Happy: 8/10 I would love to find a video of the original ones but this is a close second. Relaxed: 9/10 The only frustration that I had was trying to find the right video. The model it self was easy with no steps that I had problems with. Intellectual: 7/10 Trying to find the right video based on the thumbnail images on YouTube and then comparing the end results in case it was the same model just done differently were the only challenges. A lot of the early romantic gifts that I gave my wife back when we were dating were origami. Flowers however were the bane of my existence. Most that I tried failed. So making flowers for my wife were high on my list of ones to try. Somewhere I started calling it a lily but the video simply calls it a flower. Happy: 9/10 It came out the way it should and it looks good. Relaxed: 9/10 I didn’t have a single problem. I did have to rewind a few times but more because I had missed something not that I didn’t understand it. Intellectual: 6/10 It was pretty easy and therefore not much of a challenge for my brain.